The lights were on in the still empty NA Village store the evening of Dec. 30. 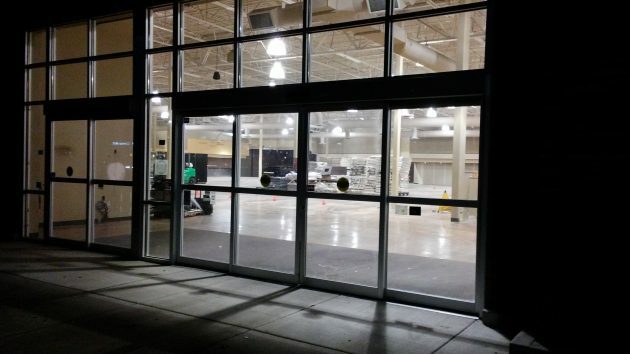 The new supermarket and hardware store planned for North Albany Village will open this spring, perhaps as early as May 1. That’s the hope of Tyler Myers, president of The Myers Group, who called me from Seattle Thursday to confirm the plans for what will be his company’s first store in Oregon. He couldn’t be sure about the timing because he’s just starting the city permitting and didn’t know how long this would take in Albany. “We’re going to move as quickly as we can,” he said. The grocery will be a full-service supermarket with all the usual departments — meat, produce, dairy and so forth — plus a deli, food service and a seating area. Because the space formerly occupied by Ray’s Food Store, which closed in December 2013, is a bit large for the market area it serves, the Myers operation will have an Ace hardware store in addition to a 30,000-square-foot supermarket. For the hardware section, the plan calls for building an addition to house a garden center. Myers said someone told him a pharmacist was interested in opening a pharmacy, and he looks forward to talking to that person. He’s also planning on a bank branch, though he’s aware that Oregon State Credit Union, which operated in the former Ray’s, has since opened a stand-alone branch across the parking lot. He expects the store to have about 50 employees. Myers does not see the Willamette River as a boundary of the service area of the North Albany market, “We’re hoping to serve residents of the downtown area and nearby areas as well,” he told me. This is magnificent news. My hope is that they will have a well balanced natural and organic selection!! Thanks for the follow up. Will be nice to have both types of stores available on this side of the river. Sure hope the community supports the stores. Thanks for the great reporting Hasso! This is great news. It is currently cold out here. A fumble is only a fumble if it hits the ground and bounces around. I trust your phone did not HH. I add to the chorus of thank you comments. Gives me hope even in the pending trump era. Vast micro (turning macro) brew selection? That was one nice thing of Rays. Such good news. Thanks for sharing. I hope this store isn’t as expensive as Rays, I only shopped there in emergencies. Thanks so much Hasso! Sure, if we also attribute the loss of 10,000 jobs at Macy’s in 2017 to Trump Effect also. Crickets from don the con’s tweet deck re: Macy layoffs. The narcissist does not want to draw attention to job losses. So happy and excited to have a grocery store again! This is very good news! I hope it will be competitively priced, at least with the prices at our local Safeway and Fred Meyer. The Ray’s store was a very nice and beautiful grocery store but was way too over priced for regular stocking up of supplies. I found it about 20 % higher than Safeway on most things. That would put a store out if of business especially now that the new Winco will come next year too. I Would love to shop there if affordable and the produce is beautiful. I live in the old downtown area and hate driving into all that congestion where they put all our other stores. So looking forward to this new store! Current grocery shopping options are definitely limited! Our current preference is Market of Choice…. a ten-mile drive! Thanks Hasso. I appreciate your good news. Thank you for this followup. I was skeptical about this market after reading early description but given Myers’ philosophy of tailoring stores to local needs this sounds like North Albany could get a much-needed resource. Hopefully they won’t be as pricey as Ray’s and hopefully they will have some good “natural foods” options. I just read an article in the Democrat Herald about this and I got a good laugh out of the real estate agent complaining that you leaked the information early!